A screenshot image with overlaid status bar and appended navigation bar placed in a device frame. For introduction to Screenshots see https://medium.com/@nocnoc/automated-screenshots-for-flutter-f78be70cd5fd. Screenshots is a standalone command line utility and package for capturing screenshot images for Flutter. Screenshots will start the required android emulators and iOS simulators (or find attached devices), run your screen capture tests on each emulator/simulator (or device), process the images, and drop them off to Fastlane for delivery to both stores. 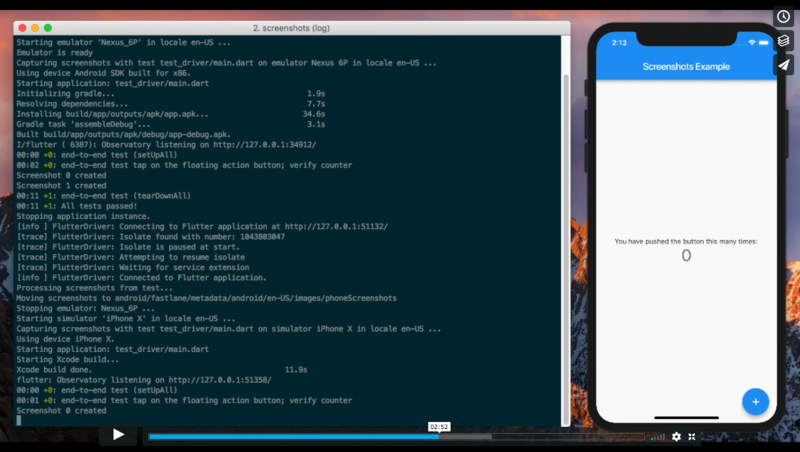 Since all three of these Fastlane tools do not work with Flutter, Screenshots combines key features of all three Fastlane tools into one tool. Plus, it is much easier to use! Write one test for both iOS and Android. Screenshots runs your tests on both iOS and Android in one run. Screenshots will run all the tests listed in config file. If your app supports multiple locales, Screenshots will optionally set the locales listed in the config file before running each test. Optionally places images in device frames in same run. Every image that Screenshots generates has a clean status bar. Screenshots drops-off images where Fastlane expects to find them. Fastlane's deliver and supply can then be used to upload to respective stores. Screenshots runs in the cloud. Screenshots works with any CI/CD tool. A special function is provided in the Screenshots package that is called by the test each time you want to capture a screenshot. Screenshots will then process the images appropriately during a Screenshots run. Screenshots uses a configuration file to configure a run. Note: emulators and simulators corresponding to the devices in your config file must be installed on your test machine. Images are in a format suitable for upload via deliver and supply. Tip: The easiest way to use Screenshots with Fastlane is to call Screenshots before calling Fastlane. Calling Fastlane (for either iOS or Android) will then find the images in the appropriate place. To change the devices to run your tests on, just change the list of devices in screenshots.yaml. Make sure the devices you select have supported screens and corresponding emulators/simulators. Note: In practice, multiple devices share the same screen size. Devices are therefore organized by supported screen size in a file called screens.yaml. Confirm device is present in screens.yaml. Add device to the list of devices in screenshots.yaml. Install an emulator or simulator for device. Screenshots will check your configuration before running. If upgrading the command line version of Screenshots, also upgrade the version of Screenshots in your pubspec.yaml. If upgrading the version of Screenshots in your pubspec.yaml, also upgrade the command line version. Running Screenshots in the cloud is useful for automating the generation of your screenshots in a CI/CD environment. Running Screenshots on macOS in the cloud can be used to generate your screenshots when developing on Linux and/or Windows (if not using locally attached iOS devices). Your feedback is welcome and is used to guide where development effort is focused. So feel free to create as many issues and pull requests as you want. You should expect a timely and considered response. See issue: https://github.com/flutter/flutter/issues/27785 for details. The default counter app with internationalization support. This is an app that demonstrates screenshots. Primary library: package:screenshots/screenshots.dart with components: io, isolate. Auto-generation of screenshots for Apple and Play Stores using emulators and simulators with support for locales. Compatible with fastlane for upload to both stores.